After months of not diving, I am anxious to breath compressed air again, and finally talk my girlfriend, Maureen, into joining me for a dive at a North Florida spring. Our planned destination is Madison Blue Springs near Madison, Florida, since it is billed as a very good dive in my Underwater Florida book. After some tricky route choices with the directions, we arrive at the gate of Madison Blue. Horrible disappointment. Disappointed to discover that their season is May through October, and we were there in the last week of April. Damn. We are later to discover that the Spring has been purchased from private ownership by the State of Florida, and there is an unknown date as to when it will re-open, and what the facility will consist of when that happens. So the dive remains on my list of "dives to do," but I'm not hopeful that the dive will happen anytime soon. Being in a region considered the springs capital of the world, we are hopeful and confident as we consult the dive book for a nearby dive. The next wothwhile-looking dive in the area appears to be Peacock Springs near Mayo, Florida. The Springs area-a state park-appears to be deserted. Not seeing a dive shop within the park, we head back to the shop we saw near the Park entrance. Turns out that the many springs at the Park were still recovering from a silt load picked up by recent flooding from the Suwannee River. The only diveable spring in the park with any sort of visibility is Orange Grove. We ask about Convict Spring down the road, and are told it is a small, not very memorable dive. At Orange Grove, we find a recently constructed boardwalk stairway that allows easy diver access to the Orange Grove sink. The sink is ordinarily mostly covered with duckweed, depending on the season, and it disperses fairly well due to diver bubbles. Large limestone walls form one side of the sink pool. See photo above. Despite the recent flooding on the Suwannee, and the siltation of much of the cave system, we find the Orange Grove dive to provide fairly good visibility (about 45 feet). Upon entering the sink, we find ourselves in a large, round cavern room. Around the edges, there are a few pass-throughs for our dive: a few large trees that have fallen into the pool, and a very short archway. At about 15 feet, there is a ledge that rings the pool. We see a number of small fish and a few turtles. We are told that a small gator lives in the sink, but we see neither the gator nor her/his mommy. Our maximum depth as open water divers at Orange Grove turns out to be 61 feet. We experience an impressive, sunlit window view by looking up at the surface of the sink from 61 feet. Silt cloudiness is a relatively minor problem during the dive, but we nevertheless regret kicking up some silt (despite being careful and maintaining good buoyancy) because there are cave divers below us. Peacock Springs contains superb examples of surface and subsurface karst limestone geology, including two major, third magnitude springs (Peacock and Bonnet), a large spring run, six sinkholes, and several small sinks and depressions. Many of the springs and sinks are diveable, but the vast majority of the diving is cave diving. The sinks and cave system provide critical habitat for at least three endangered or threatened species: the cave crayfish, the Florida cave amphipod and the Hobb cave amphipod. 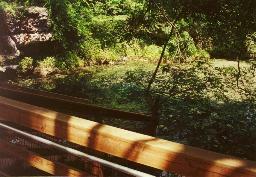 All of these features are found within the 252-acre Peacock Springs State Recreation Site. It became a State Recreation site in 1990 after several years in the hands of several private owners. Also found at the site are mature native forests including xeric hammock, upland hardwood forest, bottomland forest, and floodplain swamp. The springs feed the famous Suwannee River. Infiltration of rainwater and the flow of groundwater has dissolved limestone in the Peacock Springs area to form the largest underwater cave system in Florida. It is one of the longest underwater cave systems in the entire continental United States. There is nearly 5.5 miles of passages that have been surveyed by cave divers in the area. There are many warnings at Peacock Springs about how deadly the caves can be to the unwary. At least 45 deaths have been recorded by divers in the cave system at Peacock, including cave diving instructors. Open water divers are not allowed to carry lights.